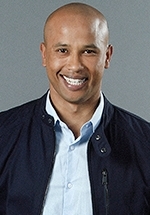 Irshaad Ally is a South African actor who rose to fame as a contestant on the second season of the reality show Survivor South Africa: Malaysia, in 2007. He was the 8th castaway eliminated from the game. A graphic designer from Maitland, Cape Town, Irshaad had a rough youth: he grew up on the Cape Flats, never finished school, got involved with the wrong people, did hard drugs and got arrested. He re-invented his life and worked his way up from a runner at an ad agency to a graphic designer. After his appearance on Survivor, he began a career in entertainment and has since appeared in several television series including eKasi: Our Stories, When We Were Black, Homeland and Strike Back. In 2015 he landed a starring role in the kykNET soap opera Suidooster, set in Cape Town in the fictional suburb of Ruiterbosch.